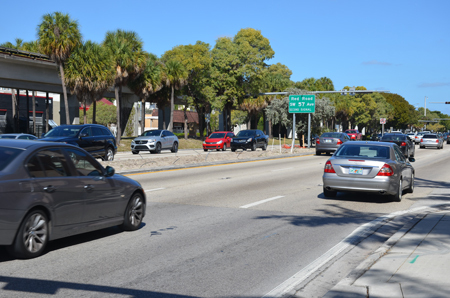 After four months of construction, in March, 2017 Florida Department of Transportation completed a $624,021 landscape project on US1 within the City of South Miami boundaries, that is, from 57 Avenue to 80 Street. 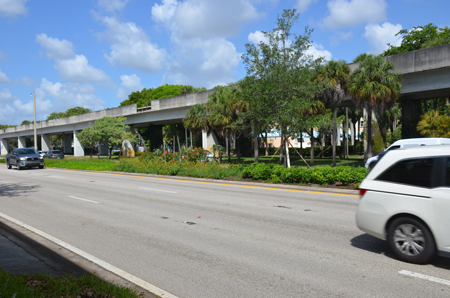 For many years, motorists coming through our community saw a barren and poorly landscaped US1 median, while Coral Gables to the north had their distinct Royal Palm landscaped median. Addressing the issue wasn’t a priority for years until a new professional city administration took the deficiencies to heart and decided it was time to make a change. 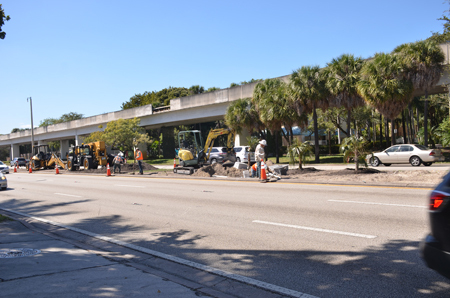 Looking south on US 1, Superior Landscaping working the job. February, 2017. That was in 2014 when Ms. Shari Kamali joined the City Manager’s office. A major concern of hers when assuming the role of Assistant City Manager (now Deputy City Manager) was the beautification of our town center’s retail and restaurant district. Kamali had formerly served as Director of Public Services for the City of North Miami Beach and ten years prior as a professional engineer with FDOT. 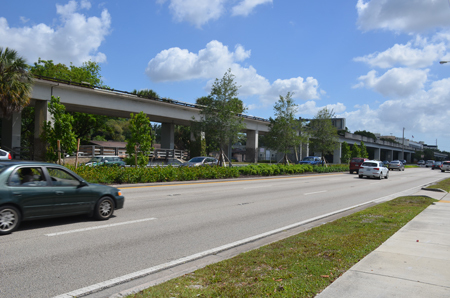 The median as it was “didn’t reflect the high expectations we have expressing the quality of our community,” noted Ms. Kamali.In mid-2014, City Manager Steven Alexander approved the request to be made of FDOT for the landscape project. Mutually agreed upon plans by the city and state were put into the work program. The project was approved with a $500K construction estimate (excluding design) and entered into the work program, which are generally slated within the next five years. Heading north toward 57 Avenue, February, 2017.